Kids and parents building wood projects together is a great bonding experience and teaches kids things they can not learn any other way. Sometimes parents need a little help choosing projects that will hold the interest of their children yet not be overwhelming to build. 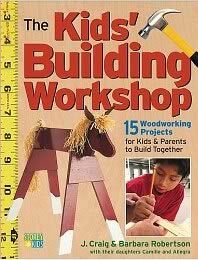 The book The Kids’ Building Workshop: 15 Woodworking Projects for Kids and Parents to Build Together has 15 great projects to serve as suggestions and guide. In addition to projects, the book also introduces tools and teaches their use, then applies them to the project for a great learning sequence.